Striding Arches is a series of Andy Goldsworthy sculptures set in the landscape at Cairnhead in the Dalwhat Glen about 7 miles from Moniaive. There are four arches in total and Cairnhead. 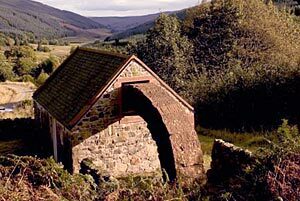 Three are on the summits of Benbrack, Colt Hill and Bail Hill, the fourth (pictured here) is at the Byre at Cairnhead and is easily accessible from the forest track. 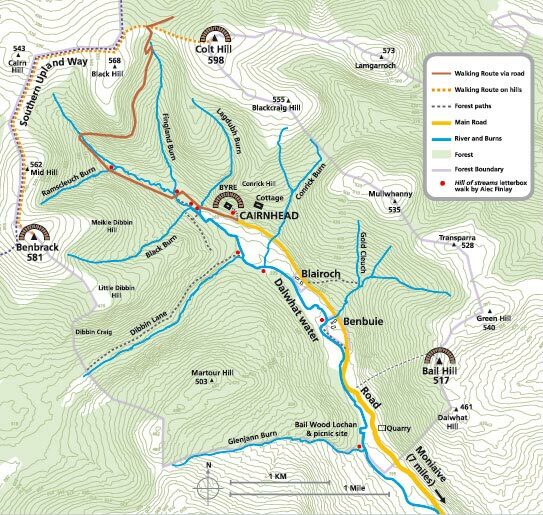 The map shows the location of all the arches. See more information at the Striding Arches website. Saturday 20th June saw the Cairnhead Carnival and performance of the new piece of work by Harpist Wendy Stewart. 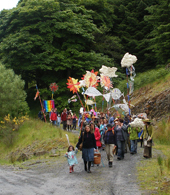 The parade started at the Byre and moved down the glen to the picnic area and lochan. 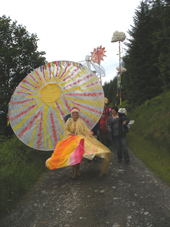 Musicians and choir played and sang as the children and adults, led by Sun Queen and Storm King, walked down the glen.